The Phantom South Africa Facebook has some photos taken in the costume department, specifically masks and headdresses. Wouah! So many props! I love this! Thanks a lot! 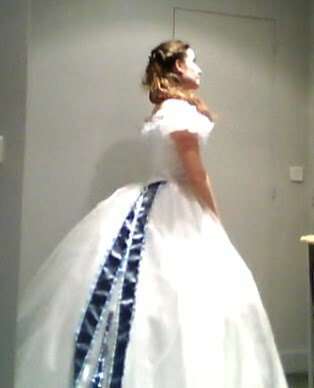 My grand Bustle is ready! I just need to make a mock up and to know exactly how many yards I need for this dress, but every piece of underwear (I don't wear my chemise/shirt here) is ready! I don't know if this will be very useful as there's a lot of reference pics of this costume on the web, but as I'm making technical drawings for my personal use (because I'm tired of looking at my 100 pics to see if there's a seam here, etc..) , I wanted to share this one, just in case, maybe it will help some of you (?) It concerns the new London version of the dress. I'll maybe change some little things on the train or trimings in the future to make my own version. 1. The faux vest is usually placed on top of the blue silk, rather than as an addition to it. This makes the front more durable and stabile. Take this into account when cutting the front panels (as it looks like you were aware of, just felt like mentioning it). Thanks for all these details! Really! For the bodice I haven't found good pics of the back of London dress but I loved the back of the Hamburg dress . It looks like the pattern I'm going to use, so it will help me. 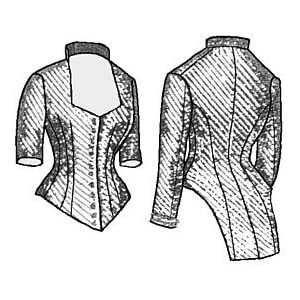 I'll use the dinner bodice from Truly Victorizn which is a natural form pattern... 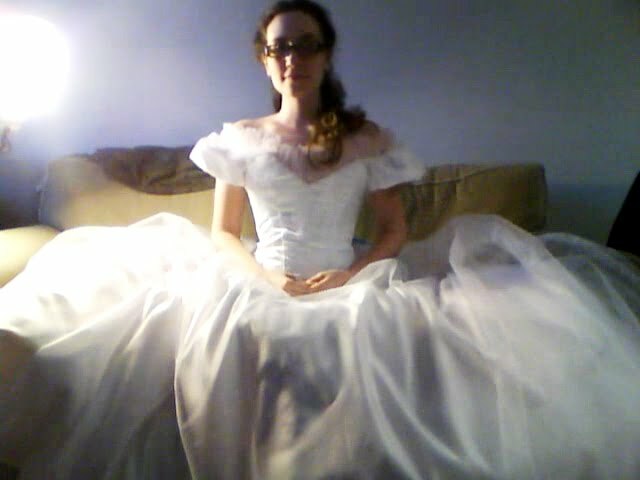 So I'll have to change several things to fit the bodice over the bustle. For the faux vest, even if I've placed a seam next to the velvet edge on my drawing, I'll try not to make this little piece of silk next to it that looks "out of nowhere". It's weird to have a small piece like this, but I refered to the new London dress I'll surely won't keep it. Thanks again for your message and for the reference pic! This will help me a lot! My gorgeous boots...just because I love them! HerMajesty wrote: My gorgeous boots...just because I love them! LOVE! Where did you get them?! Melly, did you get your fabric funded yet? And I'm still waiting on the Rapunzel fabric. No notification yet. I am also on the hunt for photos of the London back. Hamburg might have to do. Oh well. The Hamburg one is still stunning. Do you think it would really be that different? I totally adore those boots. I really do. What's your address, you say? operafantomet wrote: I totally adore those boots. I really do. What's your address, you say? I would just like to add that much to my dismay, these boots are missing from the UK tour! These boots are wonderful! Is is another piece from Peter Fox? Melly wrote: These boots are wonderful! Is is another piece from Peter Fox? Most likely, they are from the London production from about 2000-2002 I think. HerMajesty wrote: I would just like to add that much to my dismay, these boots are missing from the UK tour! Not just these. All of the original footwear and headwear is gone from the costumes. As is props. And wigs. And bottom halves. Only thing remaining intact is the bodices. Maria Bjørnson's design my foot. I'm doing an illustration of the Masquerade Triton girl and was wondering if anyone have details on the wig? The pic of the back of the wig looks like it has lots of chin-length ringlets but from all the pics of the character from the front, you never see them. Just want to get a handle on how the wig is styled, thanks! Raphael wrote: I'm doing an illustration of the Masquerade Triton girl and was wondering if anyone have details on the wig? The pic of the back of the wig looks like it has lots of chin-length ringlets but from all the pics of the character from the front, you never see them. Just want to get a handle on how the wig is styled, thanks! Some wigs have shorter hair in the back, so the ponytail of ringlets instead looks like curls around the crown of the head. The original West End wig was like that, and I think the US ones. But the basic principle is the same. Well then, take it down a notch. Complete the basics, so you have a wearable costume. THEN concentrate on the details. Vegas is first and foremost supposed to be fun, no? I don't want to work on it after the Vegas trip. I want it to be done...as in nothing left to do on it. I'm either going full effect or not bringing it. Then on to the sewing machines! You know what you have to wear if you don't bring the Red Death costume. You're back-up costume is Ramin's infamous photoshoot outfit? Don't you think that'll be a little drafty? Raphael wrote: You're back-up costume is Ramin's infamous photoshoot outfit? Don't you think that'll be a little drafty?